I am totally loving the new "adult coloring book" trend. Are you? This page of flowers to color is from the book Flowers Coloring Book: Beautiful Pictures from the Garden of Nature. If you haven't tried coloring in a while, download this page and try it. I bet you will find it relaxing and you will feel de-stressed. I am also guessing that it would make a great piece of custom wrapping paper for a Mother's Day gift! This delightful book offers a wide and enticing range of different flower types and patterns for you to personalize and make your own. The stylish outlines provide a fun way for you to improve your artistic skills using colored pencils. By the end you will have a portfolio of beautiful finished pictures as reward for your efforts and the confidence to follow your creative instincts. How to Make a Zipper Bracelet with a Vintage Sugar Bowl Gift "Box"
I had the pleasure of being a part of a big CHA Blogger event that was hosted by Fave Crafts and having a project included in their Best Blogger Craft Ideas 2014 ebook. Here is my project along with the tutorial on how to make a zipper bracelet with bling dangles, all wrapped up in a vintage sugar bowl perfect for gift giving. To start, I made a dangle from a candy conversation heart with a bit of Mod Podge and wire. I next made a dangle with the podgable papers and disc. To make the bracelet, I simply folded over the ends of the zipper and glued a bit of Velcro on each end. I like to make sure I put the soft side of the Velcro facing down and the loop (rougher) side facing up. That way the rough part doesn't scratch on my skin. I linked the dangles I made along with some pretty Darice beads to the opening of the zipper pull. My idea for using the vintage sugar bowl came from the book Just Us Girls:48 Creative Art Projects for Mothers and Daughters to Do Together. This page shows a jar being used to hold notes about happy memories and little trinkets acquired along the way that bring back thoughts of good times. I happen to do this with a cigar box. But I thought a jar would make a fun way to give a gift. So off to the stash, and I ran across this vintage sugar bowl. I embellished a tag with a sequin, a paper punched heart and some I Love to Create Tulip Beads In A Bottle. And if you would like to download the whole free ebook this project is featured in follow this link. First up this Monday, I have this fun little animation that features art from Melissa Wood's book Citysketch New York: Nearly 100 Creative Prompts for Sketching the Big Apple. Part aspirational, part creative, and all doodle. Citysketch New York is a compilation of creative prompts geared to immerse you in the marvels of brilliant New York City. Finish partially created Manhattan skylines, sketch accessories to accompany a chic 5th Ave wardrobe, doodle your own uniquely styled versions of Times Square, and loads more. With guided tips from a New York-based artist on the contours of New York architecture and art, from a fashion designer on the subtleties of New York fashion, and from a cultural expert on the people of New York as well as the food and culture. This is a complete course in Big Apple culture for the enamored. Be inspired. Get creative. After all, drawing a little will help you dream big. Melissa Wood is an illustrator and architectural planner. She regularly travels to cities all over America and the world and doodles her way through them. Her clients include Crate & Barrel, Trader Joe’s, Neiman Marcus Direct, Nordstrom’s, Kate’s Paperie, John Grisham, George Lucas, Nikki Hilton, and Oprah Winfrey. Got an Amazon Kindle? 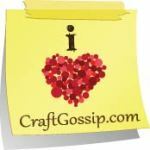 Want to grab some great craft books for just $2.99 each? Between April 25th - May 11th you can get the following list of ebooks for just $2.99! And looking for a great snack to make and then munch on while reading your new craft books? Scroll down for a healthy chocolate meringue recipe. Check out this recipe for chocolate walnut meringues from the book Don't Break Your Heart Cookbook. Walnuts, rich in omega-3s called ALAs, promote heart health in a variety of ways. They reduce bad cholesterol and decrease platelet clotting and inflammation. Walnuts are rich in magnesium and potassium, minerals that help maintain healthy blood pressure. Learn how to select, cook and flavor your food for heart healthy, delicious meals the whole family will enjoy. Nutrient rich ingredients full of flavor were the criteria for recipe selection. Saturated fat and sodium is limited, but what makes this book unique is that the recipes will make use of the growing body of research showing that prevention and wellness can be achieved with the use of heart healthy fats, fiber, certain vitamins and minerals, and phytochemicals. Each chapter focuses on an ingredient or collection of ingredients and their evidence for heart health and wellness. Nutrition facts for each recipe are included, along with sidebars and tidbits of information on the ingredients regarding their healthfulness as well as tips for buying and cooking these ingredients in general. I know we're crafty here, but every once and a while I like to share some fun facts that you can file away or share with your friends and coworkers. Today, I have 2 tips from the book Manskills: How to Avoid Embarrassing Yourself and Impress Everyone Else. This page tells you how to lose a tail and how to manage a high-speed blowout. Click on this page from Manskills to enlarge and read these great driving safty tips. Using a light but practical tone, Manskills covers everything a man needs to know in today's world. You'll find essential tips on home repair, car repair, electronics, cleaning, personal grooming, fine dining, traveling, etiquette, outdoor skills and the fine art of conversation. It's your comprehensive guide to impressing the masses! Chris Peterson is a professional writer and editor based in Brooklyn, New York. An expert in home design, repair and renovation and an avid cook, he's the author of When Duct Tape Just Isn't Enough: Quick Fixes for Everyday Disasters, A Man's Whirled: Every Guy's Guide to Cooking with the Blender, and several other books.